One of the best ways to add a warmth and light to your outdoor space is to add a fire element to it. If you do, your backyard or patio will be very comfortable during those chilly evenings and nights. You can linger outside even when the temperatures drop and the air becomes a little cold. 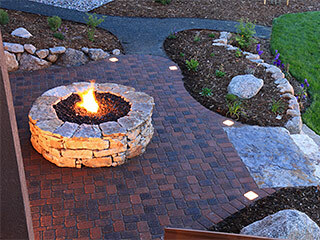 At Scapes and Stones, we’ve installed several fire pits throughout greater Las Vegas, NV and surrounds. Our clients hire us to creatively add warmth and life to their backyards and patios. The presence of fire can transform the entire environment of your property. Fire Channels - Fire channels are unique and add an interesting design element to the property. As the name suggests, this structure is a channel of fire and works like a fire pit and creates a small wall of flame at the desired location. They are eye-catching but don’t take up much space, which makes them ideal for small properties. 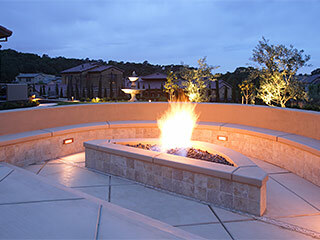 Fire Pits - These are some of the most versatile backyard installations because there are many options available to you. You can install a small, discreet fire bowl in the corner of your patio or a large pit right in the middle of it. They can be the center of the attention or a pretty little accent based on your preferences and budget. These pits come in different sizes, shapes, designs, and colors. You can install a large one with seating all around it and enjoy the camp-fire like environment it creates. They can fit into every type of architecture and you can consult with our experts if you’re unsure about the look and design of fire pits. Fire Places - Fireplaces are grand and elegant. They can bring warmth and beauty to any backyard and are usually the centerpiece of any landscape. Fire places tend to dominate the landscape but they can be a wonderful addition to large patios and backyards. You can also add a stone pizza oven to turn your fireplace into something useful and interesting. Fire Tables - These are tables with a small fire pit in the center, and can be of different shapes and sizes; they are a great addition to any backyard. If you love to entertain and have friends over frequently, fire tables are ideal for you. Our experts will explain which different types of fire features and fuel options are available & will help you choose what’s best for your property. They will make sure your patio or backyard is warm and comfortable. If you want to know more about fire pits and fireplaces, don’t hesitate to get in touch with us. Speak with the Scapes and Stones experts at this number 702-278-3228 and give us some more details about your project. You can also contact us through our online form and we will respond shortly.